Could This Be The End Of Brutal Dolphin Slaughter? May 21 could mark the beginning of the end for the dolphin slaughter in Taiji. Within a week, the Japanese Association of Zoos and Aquariums (JAZA) must decide if they wish to remain a member of the World Association of Zoos and Aquariums (WAZA) or instead to continue to do business with the barbaric dolphin slayers of Taiji. The deadline for this decision is May 21. Of these 152 members of JAZA, 30 aquariums are holding and displaying 250 dolphins. The Japanese Aquariums purchase an average of 20 dolphins each year at prices between $150,000 and $250,000. 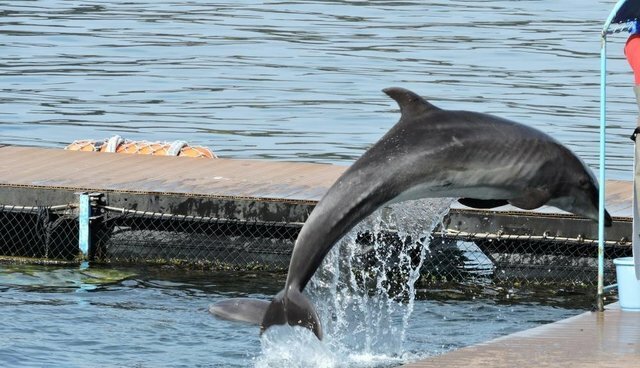 "The capturing of dolphins for food and for aquariums have been separated, and we have asked fishermen to set aside a period during which dolphins are caught only for aquariums. We have also asked them not to chase a big group to avoid panic, and not to chase them too persistently." Okada may very well have told the Taiji fishermen just that, but it's quite apparent that the Taiji fishermen never took it very seriously. In response to the WAZA decision to suspend JAZA, the governor of Wakayama Prefecture on Wednesday slammed the country's suspension from the global association of zoos as "unwarranted foreign coercion." Governor Yoshinobu Nisaka said the recent decision by the Swiss-based World Association of Zoos and Aquariums to suspend Japan's membership was "bullying, from all over the world." In other words the Governor views any criticism of the slaughter and enslavement of dolphins as "bullying" by everyone against poor little Japan as if they have been singled out for discrimination for no other reason other than being Japanese. This is not inconsistent with past criticisms of the abuse of Korean comfort women and the slaughter of millions of Chinese people as "bullying" and insensitive to Japanese culture. According to Okada, WAZA did not take issue with the use of dolphins from Taiji for years, though it proposed methods to capture them more humanely. But WAZA recently hardened its stance and around 2014 it started asking JAZA to cease obtaining animals from Taiji, Sea Shepherd along with the Dolphin Project, Earth Island and many other groups have been pressuring WAZA for years to take action. WAZA has been sandwiched between the pro-dolphin killing JAZA and the anti-dolphin killing rest of the world. Finally thanks to the persistence of all those campaigning against the Taiji kill for years, WAZA finally decided to get firm with JAZA. Zoos and aquariums around the world are on the defensive over the captivity of wild animals and the bloody slaughter and abject cruelty of the Taiji dolphin drive was causing the public to be critical of the captivity industry worldwide. SeaWorld for example has enough problems dealing with the movie "Blackfish"; they certainly do not need nor want to be the link to Taiji, and WAZA has been that unwanted link. In another week we will know if Japan decides to sulk and isolate themselves by continuing to support the butchers of Taiji or if they wish to remain connected to their colleagues in the rest of the international community.